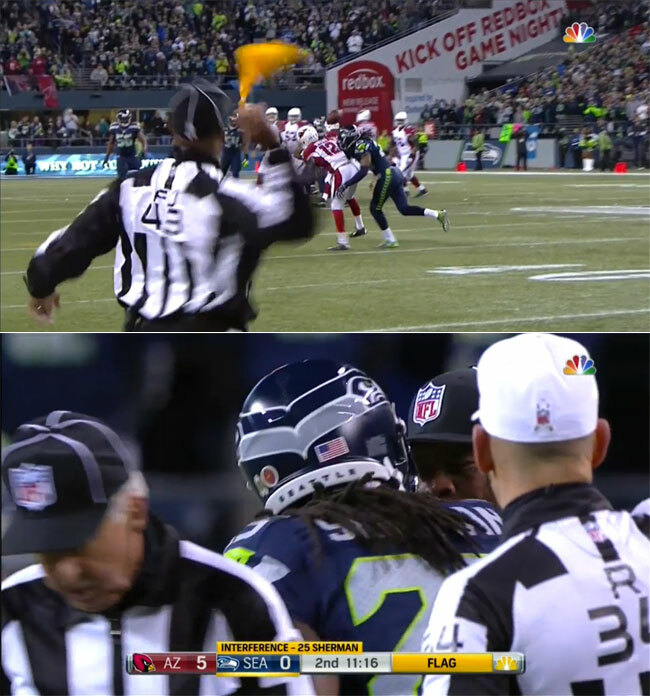 Seattle Seahawks cornerback Richard Sherman proposes four ways to fix NFL officiating—and the one thing fans should always remember. In July 2013, the summer after the referee lockout, I invited one of the replacement officials, Lance Easley, to umpire my charity softball game in Seattle. You’ll remember him as the official who signaled touchdown in the infamous Fail Mary game on Monday Night Football, giving us the win over Green Bay and, ultimately, applying enough pressure on the NFL to bring back the regular officials four weeks into the 2012 season. Our conversation at the charity event inevitably turned to that Monday night game, and Easley told me about the endless harassment he received afterward from Packers fans, including hate mail and death threats. This was a guy doing the best job he could, under intense scrutiny, on a stage he wasn’t truly prepared for, and fans wanted his head. • THE OFFICIATING CRISIS: Worse than Ever, or Just Louder Critics? Officiating NFL games is one of the hardest jobs in professional sports, and that’s why the replacement refs were yanked after three weeks. These days, with high-definition TV and rule experts on television and social media, everyone thinks he’s an expert. Everyone seems to know the rules and how they’re supposed to be called, and everybody can get the call right from the comfort of their own home, lying in bed. But in the heat of the moment, very few of us could get it right, the same way very few viewers can play the game. The first thing the league needs to do to improve officiating is narrow the margin for error by simplifying the rulebook, especially on the defensive side of the ball. That said, I do have some ideas that would make life easier on officials and make for a better game experience—and they don’t include the new measures introduced this week by the NFL. In allowing for more communication between the league office in New York and the on-field crews during games, the NFL is going about this the wrong way (shocker). If someone like Dean Blandino is trying to remotely micromanage a game from a different state, you run the risk of prolonging an already long game. There will be communication breakdowns, the same way there are communication breakdowns on a regular basis in NFL stadiums between people who are merely hundreds of feet apart. A certain amount of human error is acceptable. The first thing the league needs to do to improve officiating is narrow the margin for error by simplifying the rulebook, especially on the defensive side of the ball. There’s a great deal of redundancy in our rules that officials end up debating on the field, and these conferences disrupt the flow of the game. What constitutes illegal contact, and how is it different from pass interference and defensive holding, and how egregious does any of it have to be to constitute unsportsmanlike conduct? For how many officials there are in the NFL, they do an excellent job of being consistent from one crew to the next on interpreting fouls, but they all make mistakes. Officials become paralyzed by the process of interpretation and it leads to inaccurate calls that leave us shaking our heads days later in the film room. Chopping the rulebook in half will speed up the game and simplify things for the officials. So that’s No. 1: Simplify the rules. No. 2: Add an eighth official, and make this position a fulltime job that requires a complex understanding of probably the most complicated rulebook in sports. It makes no sense that at least one person on every crew isn’t committing the same amount of time that the players commit to the game. To improve the quality of anything you have to invest in it. No. 3: Reconfigure the positions. The most important calls in football, in my opinion, are offensive and defensive pass interference. If you go by yardage alone, they’re the most impactful penalties, and yet the officials who call most of these fouls are standing 20 yards beyond the line of scrimmage, often looking through the backs of defensive players. Adding an eighth official would allow for two officials to be 20 yards off the ball, and two to be on the sidelines. The two sideline guys would start five yards off the ball and sprint with the receivers down the sideline to get the best perspective of the space between the defensive backs and the receivers. The deep officials, meanwhile, would concentrate on the safety and linebacker play. Adding another set of eyes and improving the angles will help officials become more certain about their calls and more definitive in their explanations. Which brings me to my fourth and final fix. No. 4: Improve communication between players and officials. My only complaint about the actual job the officials are doing is the occasional lack of explanation for questionable calls. When they can’t or won’t explain themselves, it becomes difficult to play because you don’t know what you’re doing wrong. I get why some don’t talk. When coaches are screaming at them on a consistent basis, the human element kicks in and guys can shut down. But if you talk to them with respect, they talk to you with respect, and most of the officials will calmly explain a penalty. Yet for some reason, those aren’t the guys you see in the playoffs. With all that said, I’m ultimately nitpicking. The officials in the NFL are the best and most qualified in the world. Slamming them for doing the best job they can do is almost as ignorant as threatening Mr. Easley’s life over a touchdown. Take a deep breath, and remember: It’s just a game. The Officiating Crisis: Worse than Ever, or Just Louder Critics?